I went around clicking pictures of the Hanumath Jayanthi festival at Ragigudda Temple on the morning of the day I left (yes, indeed, I was THAT organized in my packing!) and this wonderful offer, right at the arch, caught my eye…. 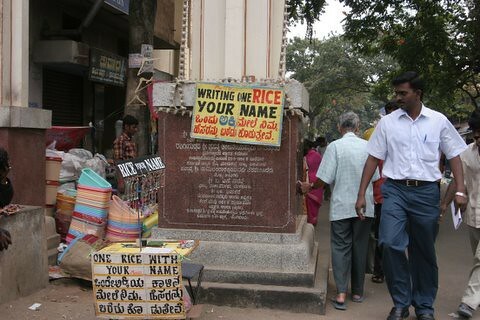 Don’t miss also the offer to rice your name. No, I didn’t buy the one rice after all. I knew that I would lose it somewhere and looking for it would be like looking for…well, a grain of rice!